You can create your own keyboard shortcuts in Office for Mac using the steps in this article. You can create custom keyboard shortcuts in Excel or Word for Mac within the application itself. To create custom keyboard shortcuts in PowerPoint, Outlook, or OneNote for Mac, you can use the built-in capability in Mac OS X. On the Tools menu, click Customize Keyboard. In the Categories list, click a tab name. In the Commands list, click the command that you want to assign a keyboard shortcut to. Any keyboard shortcuts that are currently assigned to the selected command will appear in the Current keys box. Tip: If you prefer to use a different keyboard shortcut, add another shortcut to the list, and then use it instead. In the Press new keyboard shortcut box, type a key combination that includes at least one modifier key ( , CONTROL , OPTION , SHIFT ) and an additional key, such as + F11 . If you type a keyboard shortcut that is already assigned, the action assigned to that key combination appears next to Currently assigned to. Note: Keyboard shortcut descriptions refer to the U.S. keyboard layout. Keys on other keyboard layouts might not correspond to the keys on a U.S. keyboard. Keyboard shortcuts for laptop computers might also differ. You can delete keyboard shortcuts that you created, but you cannot delete the default keyboard shortcuts for Excel. In the Commands list, click the command that you want to delete a keyboard shortcut from. In the Current keys box, click the keyboard shortcut that you want to delete, and then click Remove. Note: If the Remove button appears grayed out, then the selected keyboard shortcut is a default keyboard shortcut, and therefore it cannot be deleted. To restore keyboard shortcuts to their original state, click Reset All. From the Apple menu, click System Preferences > Keyboard > Shortcuts > App Shortcuts. Click the + sign to add a keyboard shortcut. In the Application menu, click the Office for Mac app (Microsoft Word, Microsoft PowerPoint, Microsoft OneNote, Microsoft Outlook) you want to create keyboard a shortcut for. Enter a Menu Title and the Keyboard Shortcut and click Add. Tip: If you aren't sure what the menu name is for a command, click Help in that app and search for what you want, which will then show you the exact menu name. 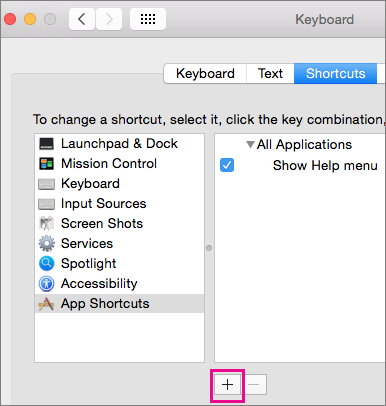 Important: You can create a keyboard shortcut to help you quickly do a task. However, if the keyboard shortcut conflicts with a default Mac OS X keyboard shortcut, it will not work unless you turn off the Mac OS X keyboard shortcut. In the Categories list, click a menu name. In the Commands list, click the task that you want to assign a keyboard shortcut to. Any keyboard shortcuts that are currently assigned to the selected task appear in the Current keys box. In the Press new keyboard shortcut box, type a key combination that includes at least one modifier key ( , CONTROL , OPTION , SHIFT ) and an additional key, such as + OPTION + F11 . You can delete keyboard shortcuts that you added, but you cannot delete the default keyboard shortcuts for Excel. In the Commands list, click the task that you want to delete a keyboard shortcut from. You can create a keyboard shortcut for a symbol, such as the telephone symbol from the Zapf Dingbats font ( ). For example, to create a keyboard shortcut to insert the telephone symbol, you could assign COMMAND + OPTION + SHIFT + T .
On the Insert menu, click Symbol. Click the tab with the symbol or special character that you want. If it is necessary, select a font on the Font pop-up menu. Click the symbol or character that you want. Click the symbol or character that you want to delete a keyboard shortcut from. To restore keyboard shortcuts to their original state, click Reset All, and then in the confirmation message, click Yes. Keyboard shortcuts for tasks are reset. To use a keyboard shortcut that is the same as a default Mac OS X keyboard shortcut, you must first turn off that Mac OS X keyboard shortcut. On the Apple menu, click System Preferences. Under Hardware, click Keyboard, and then click the Keyboard Shortcuts tab. For the keyboard shortcut that you want to turn off, clear the check box. In the list next to Categories, click the task that you want to assign a keyboard shortcut to. In the Press new shortcut key box, type a key combination that includes at least one modifier key ( , CONTROL , OPTION , SHIFT ) and an additional key, such as + F11 . In the list next to Categories, click the task that you want to delete a keyboard shortcut from. Under Hardware, click Keyboard . On the Keyboard Shortcuts tab, click Application Shortcuts, and then click Add . On the Application pop-up menu, click Other, click Microsoft Office 2011, and then click Microsoft PowerPoint. In the Menu Title box, type the name of the command that you want to add. For example, to create a keyboard shortcut for the Paragraph command on the Format menu, type Paragraph... into the box. In the Keyboard Shortcut box, type a key combination that includes at least one modifier key ( , CONTROL , OPTION , SHIFT ) and an additional key, such as + OPTION + F11 , and then click Add. On the Keyboard Shortcuts tab, click Application Shortcuts. Click the keyboard shortcut that you want to remove, and then click Delete .